Hepatitis D is a viral infection caused by the hepatitis D virus (previously called the Delta agent). It causes symptoms only in people who also have hepatitis B infection. 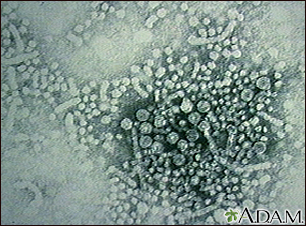 Hepatitis D virus (HDV) is found only in people who carry the hepatitis B virus. HDV may make liver disease worse in people who have either recent (acute) or long-term (chronic) hepatitis B. It can even cause symptoms in people who carry hepatitis B virus but who never had symptoms. Hepatitis D infects about 15 million people worldwide. It occurs in a small number of people who carry hepatitis B. Hepatitis D may make the symptoms of hepatitis B worse. Many of the medicines used to treat hepatitis B are not helpful for treating hepatitis D.
You may receive a medicine called alpha interferon for up to 12 months if you have a long-term HDV infection. A liver transplant for end-stage chronic hepatitis B may be effective. People with an acute HDV infection most often get better over 2 to 3 weeks. Liver enzyme levels return to normal within 16 weeks. About 1 in 10 of those who are infected may develop long-term (chronic) liver inflammation (hepatitis). Call your health care provider if you have symptoms of hepatitis B. Detect and treat hepatitis B infection as soon as possible to help prevent hepatitis D.
Avoid intravenous (IV) drug abuse. If you use IV drugs, avoid sharing needles. Adults who are at high risk for hepatitis B infection and all children should get this vaccine. If you do not get Hepatitis B, you cannot get Hepatitis D.
Alves VAF. Acute viral hepatitis. In: Saxena R, ed. Practical Hepatic Pathology: A Diagnostic Approach. 2nd ed. Philadelphia, PA: Elsevier; 2018:chap 13. Landaverde C, Perrillo R. Hepatitis D. In: Feldman M, Friedman LS, Brandt LJ, eds. Sleisenger and Fordtran's Gastrointestinal and Liver Disease. 10th ed. Philadelphia, PA: Elsevier Saunders; 2016:chap 81. Thio CL, Hawkins C. Hepatitis B virus and hepatitis delta virus. In: Bennett JE, Dolin R, Blaser MJ, eds. Mandell, Douglas, and Bennett's Principles and Practice of Infectious Diseases, Updated Edition. 8th ed. Philadelphia, PA: Elsevier Saunders; 2015:chap 148.